The Swim Meet took place Saturday, November 8 and was the latest in the series of successful events leading up to the Special Olympics National Games next weekend and the Special Olympics World Summer Games in Los Angeles in July 2015. The outstanding efforts of the athletes and their level of completion showed once again that their ability prevails over their disability. Athletes battled it out in the kickboard race, 25m freestyle, 50m freestyle, 25m breaststroke, mixed 25m relay and 4x25m freestyle. In Special Olympics, everyone is a winner. Therefore, all athletes were awarded for their effort. 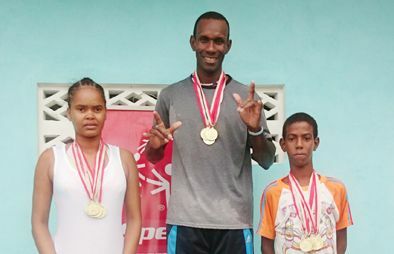 However, Krista Bynoe and Walsh Ollivierre, who attend the Sunshine School for Children with Special Needs, Bequia, were awarded Best Senior Female Swimmer and Best Junior Male Swimmer respectively. Rudolph Thompson of Biabou, a past student of the School for Children with Special Needs Kingstown, was awarded Best Senior Male Swimmer. Well done, to all of them. The high level of performance looks very good for our athletesâ chances of winning medals in aquatics at the Special Olympics World Summer Games 2015. Four athletes, Krista Bynoe, Racquel Miller, Kemuiel Frederick and Walsh Ollivierre from Bequia, will be competing in aquatics at the World Games. The swim meet kicked off the National Games, which will be held at Victoria Park, starting on Friday, November 14. The National Games will be the highlight of the Special Olympic year and begins with a grand opening ceremony at 4.15 p.m. on Friday. The following day (Saturday, November 15) the Games begin at 9.30 a.m. Special Olympics SVG encourages everyone to come and support our athletes and enjoy athletics, bocce and a host of field events.